Trusted Managers – now able to control modules! We are excited to announce the recent changes we’ve done for Trusted Managers section. 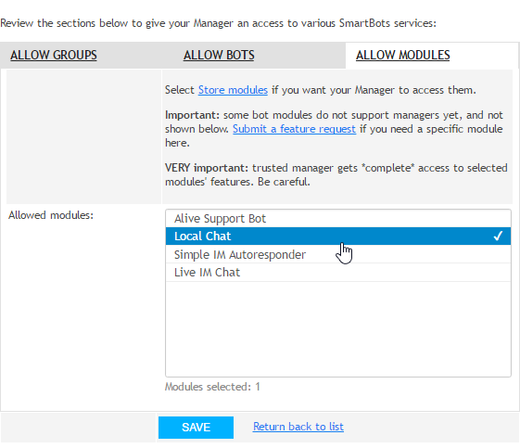 Your Trusted Managers are now also able to control the bot modules you purchase at Bot Store. Local Chat – the same as Live IM, but speaking to a local chat. As soon as you assign specific modules to your manager, he get the complete control over that module (however, without an ability to attach/detach modules – this is still your personal ability). 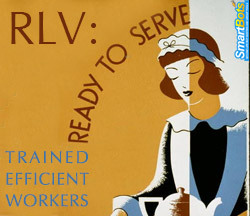 Try the RLV module today – 70% off! The RLV support module is now available in the bot store! 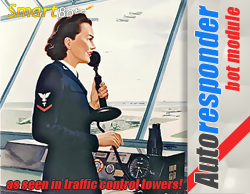 It has just been developed so we are offering it at a 70% discount until July 31st. Try it with you favorite RLV devices and if any features are missing please let us know so we can update the module. To get the module at 70% off use the coupon code – TRYRLV which expires July 31st. For more information about the module please visit this link, the module can be purchased from the bot store. All updates with any module are always free and are automatically applied when available. Note: The RLV module currently only works with standard personal bots. Bot Store: featuring Immortal Bots – special Christmas offer! Dear customers! 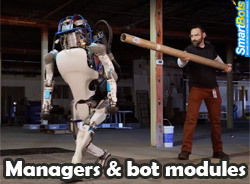 We are glad to inform you that we’ve opened the SmartBots Bot Store: the place to buy bots-related stuff: add-on modules, devices, advertising tools and other useful things. Bot Store is a new special marketplace at SmartBots. It is intended to sell various tools and devices which work with SmartBots. It is not a replacement for SL Marketplace or in-world stores. It’s just a handy place for SmartBots customers to locate a useful device, tool or script which works with bots, groups or helps advertising. Enter Bot Store by clicking on “Bot Store” menu in your SmartBots account. At the very beginning we will be selling our devices and modules in Bot Store. However, Bot Store supports third-party sellers: all developer will be able to sell their creations here: directly to the customers. 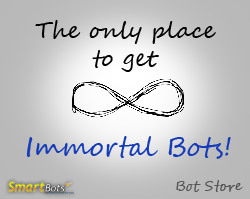 The very first bot module you can purchase in Bot Store is “Immortal Bot Module”. This is a special Christmas offer: the module makes your Model Bots never-expiring! Yes, this means that you don’t need to pay subscription anymore after you assign Immortal Bot module to your Model bot. Read more here about Immortal Bots here.